Infrared data from NASA's Terra satellite revealed that the area of coldest cloud topped thunderstorms has dropped from the previous day, indicating weaker uplift and less-strong storms. On Sept. 5 at 2:10 a.m. EDT (0610 UTC) NASA's Terra satellite passed over Olivia and analyzed the storm in infrared light to show temperatures. The MODIS or Moderate Resolution Imaging Spectroradiometer instrument aboard NASA's Aqua satellite revealed cloud top temperatures as cold or colder than minus 70 degrees Fahrenheit (minus 56.6 degrees Celsius) in fragmented areas southwest and east of the center. NASA research indicates very cold cloud tops with the potential to generate very heavy rainfall. At the time of the satellite image, Olivia had weakened but it was still a Category 3 hurricane. Olivia encountered moderate easterly wind shear which continued to weaken the storm. By 11 a.m. EDT (1500 UTC), the National Hurricane Center or NHC said Olivia weakened to a Category 2 hurricane on the Saffir-Simpson Hurricane Wind Scale. 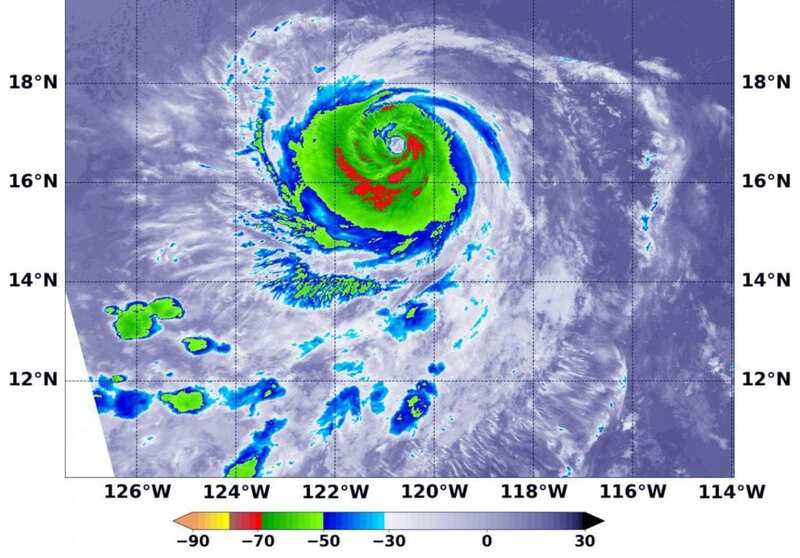 The center of Hurricane Olivia was located near latitude 17.1 degrees north and longitude 122.3 degrees west. Olivia was far from land areas. It was 900 miles (1,445 km) west-southwest of the southern tip of Baja California, Mexico. Olivia is moving toward the west near 13 mph (20 kph), and this motion is expected to continue today. A turn toward the west-northwest is expected tonight, followed by a gradual turn back toward the west over the weekend. Maximum sustained winds have decreased to near 110 mph (175 kph) with higher gusts. The NHC said additional slow weakening is expected during the next few days.